Hello.. Our GSD Puppy has come into her first heat last Wednesday (30.06.10). Since collecting her at 9 months she has been great with other people and all dogs even ones that were funny with her and she never ever barked. A few weeks before this 1st heat she started barking initially in her sleep and then more frequent. When I am walking her and she sees someone 50% of the time she now barks and if its another dogs always barks and seems a bit I dont want to say aggressive because she is so soft but it does look a bit that way. I do try my best to control her but she will not walk away. This morning when we left the house as soon as I opened the door she started barking and I could then hear another dog bark back, as we got outside she stopped. This is my first GSD, I have always had Spaniels soo different however I would never go back now but I am trying to read up & understand her as much as possible. I am thinking that she is maybe protecting her area or calling for boys.. & I hoping that the barking may cease after this heat. Although she is barking away for the area too. Please could you give your opinion on this and if it is not for the reasons above please advise the best way to encourage her not to bark. Comments for GSD 9mths old.. First heat & has started to bark for the first time. Bring some sort of treat she really loves that she doesn't get very often. As you are walking, when she begins to bark (at sight of another dog, person etc) IMMEDIATELY turn in the opposite direction. She may resist but you must be the Alpha dog here. If this technique does not help, use the treat method. Each time she barks at inappropriate times, make a sharp, high pitched sound (like a mom doggie does to her litter for "crowd control"). The very minuste you do that, it is a distraction for her. As soon as she stops barking for a few seconds, give her praise and one treat. GSD's are smart doggies. It will not take her long to connect the treats with the no barking. As she progresses, you can have her stay in the vicinity of the distraction, and keep HER distracted. The longer she goes without barking she gets her praise and her treat. Eventually you can leave out the treat and simply have taught her that the distraction is nothing to fear. With my own dogs, I added the visual of putting my finger to my lips in a "shh" manner. After awhile, I only had to shush them and the barking stopped. This techinique takes some practice on your part but you should be happy with the results. Personally I do not believe in teaching a dog through negative discipline. 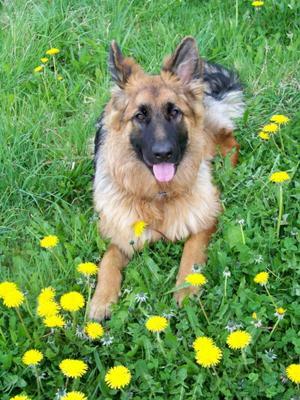 GSDs are so intelligent, you can teach with positive reinforcement and go a very long way with them. Most of the time you will find this type of barking is nervous or fear related. If you distract her long enough for her to have a stronger desire for your praise and/or treat than her desire to bark, she will learn other dogs and people are not to be feared. Some aggression is based in fear, so we have to try to understand her point of view and work accordingly. Hope this helped, she is positively GORGEOUS! !